Wow, I’m exhausted, but incredibly happy! I’ve been working insane hours all week to get Google’s just-announced OpenSocial APIs implemented in Plaxo Pulse and launched live by the time of their announcement. And we did it! We released full support Thursday night, making Plaxo the first site to publicly implement OpenSocial. Yay! I only found out about OpenSocial less than a month ago (I was on vacation in France when the initial disclosure event took place, but Marc Canter brokered an introduction when I got back; Thanks, Marc!). And the project inside Google was being developed fast and furious the whole time, which meant the specs were in a constant state of flux and there wasn’t a lot of time for such frivolities as “documentation” or “Q&A sessions”. The launch of OpenSocial itself went better than anyone could have possibly planned. After spending several weeks under strict NDA and not even being able to know who the other container or gadget developers were, we were all a bit dismayed when a New York Times writer did enough digging to leak most of the story a few days early. Google decided that rather than try to keep the lid on any longer, they would release the embargoes early, so starting Tuesday night there was an explosion of public excitement in the press and blogosphere. The reaction was overwhelmingly positive, and by the next day the story got even more exciting: MySpace, Bebo, and SixApart joined as last-minute partners (previously there were several social networks agreeing to support OpenSocial, but none as big as these new entrants). Suddenly it looked like the whole world was going open (save, of course, for Facebook). This led to yet another round of frenzied reporting, which in turn made the OpenSocial announcement even bigger. Since Plaxo was listed as one of the original supporting partner sites, all of these stories mentioned Plaxo, which means I could track them all in Bloglines via the Plaxo keyword search feed. This was like having a little web beacon plugged into all the stories posted everywhere, and it was just amazing to see how many different publications wanted to cover it. Bloglines (which I love) has this annoying feature that it won’t keep more than 200 unread items per feed. Normally the Plaxo feed gets 10-20 hits per day. Since Tuesday night, I had to check it every couple of hours or it passed the 200 mark. And, perhaps not surprisingly, our traffic at Plaxo also shot through the roof after the announcement went out. Despite the early leak, Google kept its internal launch schedule the same. On Thursday night, I was invited to Campfire One: a small, invite-only gathering of some of the key developers participating in the launch. They actually built a campfire in the middle of Google’s campus and gave us all folding chairs, blankets, mugs of hot cocoa, and long marshmallow roasting forks to make s’mores with. 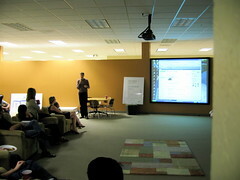 They made a series of presentations on OpenSocial, showed demos of it working in sites like Hi5 and LinkedIn, and showed off popular gadgets like iLike and Flixster. Then they told everyone to roast marshmallows and mingle. 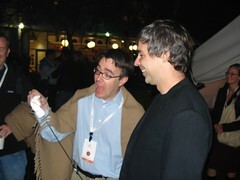 To my surprise, I ended up next to Larry Page and Eric Schmidt standing around one of the fires. I was very impressed that not only had they showed up to this event, they totally got the vision for the open social web and were excited about seeing it develop further! This was the first time I’d met many of the other participants in the OpenSocial project, so it was great to finally “step out of the dark” and be able to talk openly with them all about working together. I told everyone that Plaxo was planning to launch our OpenSocial support live right after the campfire ended, which became a source of much talk and excitement. Apparently all the other sites had just gotten internal demos running, but none of them had plans to go live until things settled down a bit and got more stable, say late ’07 or early ’08. The Google team said they had a spreadsheet a mile long of changes they planned to make in the short term, but if I didn’t mind fixing things as they broke, they were thrilled to have a real implementation available for people to play with. When Larry brought his marshmallows over share with some of the other Googlers (including Sergey Brin, whom I also hadn’t seen earlier), he exclaimed “hey, those Plaxo guys are launching OpenSocial support tonight!,” so I felt confident that the extra work required to launch support so early was well worth it. The official launch of OpenSocial brought yet another round of press frenzy, and the fact that Plaxo was the first site to go live with support became a story itself. We were already planning to have a party on Friday afternoon to celebrate getting the code live, but we decided at the last minute to open the party to the public and use it to give a public demo of OpenSocial running live in Plaxo. We posted the invitation to our OpenSocial “Open Social” on Thursday afternoon and on Friday at 4pm we had about 100 guests at Plaxo HQ with whom to share some pizza, beer, and talk of the open social web. I then showed a bunch of gadgets running in my Pulse profile page, including horoscope, iLike, and Slide’s FunWall and TopFriends, both of which are impressively sophisticated apps, and among the most popular apps on Facebook. 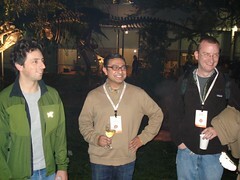 I met Slide’s CTO Jeremiah Robinson at the campfire, and he was eager to make sure his apps ran well on Plaxo. After a bit of back-and-forth IMing and tweaking on Friday, they all ran beautifully–a testament to the well-executed design of OpenSocial! It’s amazing to think that less than 24 hours after launching this major new platform, not only is it running live in Plaxo, we already have several first-class gadgets from top developers like RockYou and Slide. If Plaxo had tried to build our own proprietary platform, we could never have successfully wooed these developers to build exclusively for us, let alone had things up and running this quickly. That’s why open always wins, and that’s why we love open standards at Plaxo. This is just the beginning–there’s so much more to do to truly open up the social web. 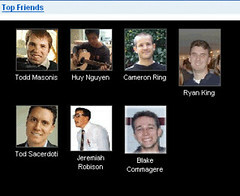 But OpenSocial is a huge milestone, not only because so many large players are now supporting the open social web, but also because the launch was so large and successful that it introduced a ton of people to the concept of open and got them thinking about what more could be done here. It’s an incredibly exciting time, and you can bet I’m going to keep driving things the best way I know how: by talking about the vision, and then backing it up by shipping real code. P.S. : Here’s a video I recorded earlier this week at Google talking about Plaxo’s involvement in OpenSocial. P.P.S. 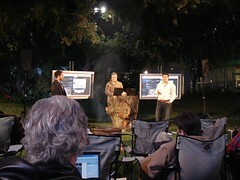 : Here’s a video of the demo I gave on Friday, captured by Chris Heuer.